oh...my...god me gusta mucho los conquistadores de ecuador. how can you not love guys who dress up in donkey ears and tails and dance around with huge smiles while wearing white matching fringed outfits? and omg the shaved head/long ponytail in the back combo is always a killer. the closeup shot of them wiggling their little donkey tail booties is priceless. 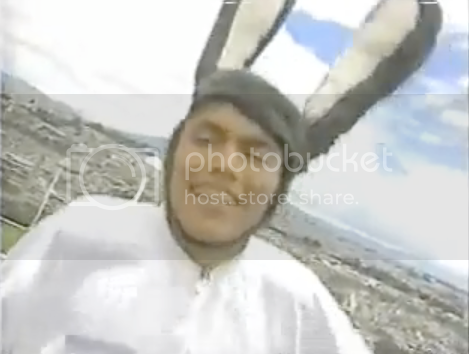 im guessing 'mi conejito' is their biggest hit because they made more than one video for it - the second one has los conquistadores not only dressed up as donkeys but also in giant ponchos rockin out on top of a police car!!! in the last video for 'mentirosa' they ditched all their funny clothes and went for smooth, slick pink shiny button ups and some high-kicking dance moves. actually it's more like an aerobic routine than actual dancing. i love them. DON'T WORRY IT WILL BE OK!! !